Atheist Republic is a community of over 25 writers, editors, designers, social media gurus, web-masters and you! We proactively draw from this diverse well of knowledge and experience to curate resources for atheists of all different expressions worldwide. We know that each individual atheist has different needs and requires different tools for living well. Here we provide book suggestions, articles, videos, charts and graphs and data for you to use as a source of encouragement and inspiration, fuel for debates, food for knowledge growth and fodder for conversation with other atheists and the religious. We hope you find this section useful. It is a work in progress as we will be adding to it ongoing. If you have suggestions, please let us know! At Atheist Republic Discussions we discuss & debate topics on atheism, politics, religion and other subjects the Atheist Republic community want us to tackle. Are you afraid of sharing your views with those around you? We can help provide resources for additional assistance and be a friend to someone who needs one. We see requests often where people are hoping to find assistance in getting out of their country. Atheist parents experience many of the same challenges as every other parent and need just as much support. Here we provide tools and encouragement for the journey. Want to have a discussion? Request to have an online video discussion with one of our team members. It can sometimes be difficult to find documentaries about religion from an atheist perspective or good stories about influential, interesting, revolutionary atheists. But they are out there and you can find many of them here. Atheists are not always portrayed positively on the big screen and very few movies directly address religion through the lens of an atheist. Here are some movies that have atheistic messages or references. Podcasts are great if you're on-the-go, but if you have time to sit, relax and enjoy some relevant discussion, these YouTube channels will be right up your alley. A list of Podcasts for every Atheist. Listen to discussions and debates from Atheists on current events, political views and all things religious. Discussions and debates with atheists and visiting theists. Ask a question or share your opinions. All viewpoints are welcome. A great collection of quotes and sayings about God, religion, secularism and more in visually rich expressions. Many different charts and infographics have been made about religion and atheism, providing a visual way to communicate a variety of data and information. Here we give you some of the most useful...or at least entertaining. Numerical data is useful in understanding the state of religion and atheism around the globe and engaging in informed conversation. Here we provide you with a variety of interesting and useful numbers and demographics. Creative Expression provides an opportunity for atheists to share short fiction, poetry and visual art that communicates interests, values and concerns of atheists to inspire and validate the global community. Have any questions about science that you want answered? Check out this section! You don't have to protect your human rights, under law, all alone. Let Atheist Republic help connect you with volunteer legal professionals. 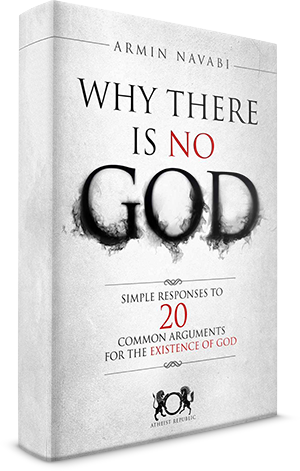 Here is a list of books published by Atheist Republic. Personal stories and opinions form other atheists on topics like: how can atheists be moral, common misconceptions about atheism and more. If you're looking for atheist ideas that will inspire, make you think, or just need a good laugh, check out the video clip page and watch our gallery of curated atheist video clips. Want to show the world that you're part of Atheist Republic? Download a cover now and use it on your Facebook or Twitter Profiles!